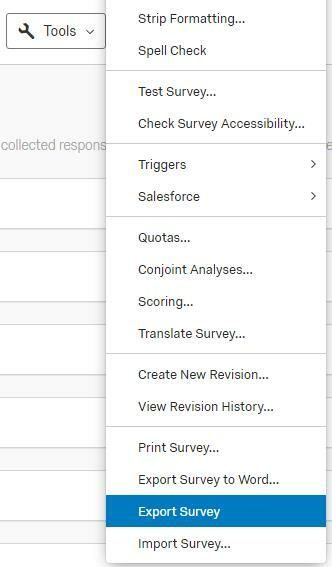 It is now possible to import surveys created within a Qualtrics project into GIFT, with a couple of notable exceptions. Please review this entire document before attempting to import your content. GIFT will successfully import a variety of standardized question types, such as multiple choice, free response, and scales; question labels should appear within GIFT’s survey system as well in the question properties interface. Some of Qualtrics presentation options for certain question types may be converted into a default GIFT format, however the integrity of those questions should be preserved in most cases. GIFT is able to import a survey export file from Qualtrics (this file has the extension .QSF). Qualtrics projects are organized into blocks, and typically each block contains a questionnaire or set of questions. It is important to note that Qualtrics only provides an export function for an entire project, therefore your entire Qualtrics project will be imported into a single GIFT survey. If you only want to import a single questionnaire into GIFT, it is recommended that all of the corresponding questions are contained in one block and that one block is copied into a new project. This will ensure that only the questions you want are imported into the corresponding GIFT survey object. *Note that if you import a QSF file containng multiple blocks, each block will be separated by a page break in GIFT. Additionally, page breaks in Qualtrics will also appear as page breaks in GIFT. 2. Your survey export will download automatically to your browsers’ default download location, make a note of where this file is located. The file will be named with the project name followed by the extension QSF. 3. Next, open GIFT and go into the Course Creator (either create a new course, or edit an existing course from the Take a Course homepage). 5. 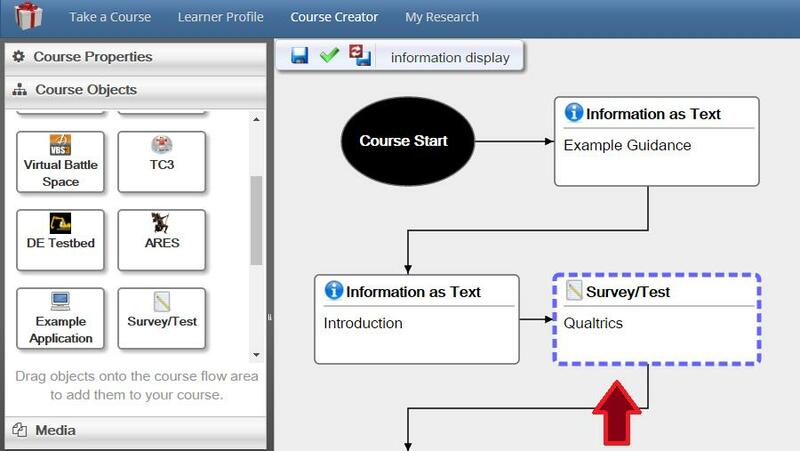 Either create a new survey, or select an existing survey to edit within the Survey Editor. Note: If you import a QSF file into an existing survey, the imported items will appear on a new “page” at the end of the existing survey. 6. Click the Import from QSF file, and drag your Qualtrics export (from step #2) onto the designed area. The process will start automatically. 7. You may see a warning message describing any content that was not able to be imported into GIFT. 8. Make sure to name your survey, otherwise you will receive an error when attempting to save your work. 9. Once the import process has completed you can visually inspect the survey, make changes, delete pages that you do not want in the GIFT survey, and assign scoring to your questions (if applicable) using the “Scoring Mode” button at the top of the interface.